Cam's little sister has unbelievably appeared in front of him, but their challenges have not ended yet. How quickly can you find these racing words? Successful networking is not about how many business cards are handed out. At their day jobs, this father and son advise following the safe route, but a erhours their hobby is going fast. An evening of costumes and a morning of learning. ON THE COVER: Local son and father Formula Vee racers, Brian, left, and Mark Farnham, at their garage. 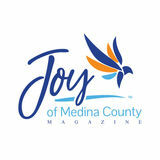 Joy of Medina County Magazine is distributed for free as an e-edition and in print. 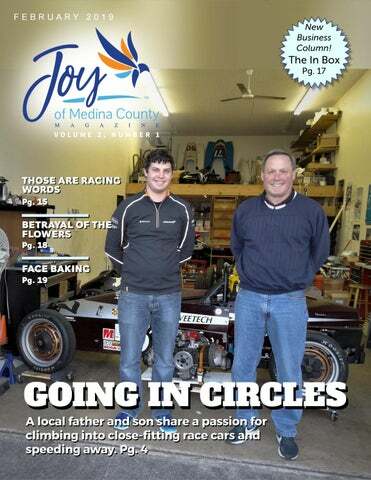 To subscribe to the e-edition, see past issues, and to order print issues and copies of photos, go to JoyofMedinaCountyMagazine.com. Additional features not seen in the magazine, such as Giving Hearts, also can be found on the website. For those employed but still unable to aﬀord medical care, Medina’s Free Clinic is just the help they need. If you have trouble with your foundation and concealer creasing, this may be the technique for you. Treat a special someone to luxurious homemade fudge with nuts or an orange twist. If cabin fever is starting to make you itch, time to check out our activity list! The workbench at the Farnham racing garage. The remnants of Brian's go­kart racing days. cars, safety equipment includes a six-point harness; helmet; and twolayer driving suit, which includes a fire resistant under layer. Brian appreciated all of the safety equipment that is used when, during a race, his car got “knocked up on two wheels, onto its side.” His injuries were limited to feeling beat up and gaining some bruises. He said, with a slightly twisted grin, that he did not feel his injuries until he got out of the race car. That was when the pain set in. “It’s a good pain,” Mark said, with Brian eases his large frame into the car he built. His shoes are beside the Brian nodding in agreement. car to allow him to more easily get in the car. “I just love the competition,” Mark said. “I already told Cindy I’m got his pilot’s license and started flying small racing until I’m in my 80s. My dad’s 86 and he is planes. still flying.” Some of the radio-controlled planes Edward Edward Farnham, Mark’s father, started flying flew were ones he had built himself. Mark said his radio-controlled airplanes at Sharon Center. father still has some of those planes in his When the land he was flying on was developed basement. and he could no longer fly his airplanes there, he Even though he grew up with a dad who had a The workbench at the Farnham racing garage. The Farnham fleet: The black car is Mark's and the car with primer (gray) is Brian's. They recently sold the yellow­and­red car and are working on selling the maroon car in the far back. Winning the costume contest were, from le : Noah Arntzen as the Rocketeer, third place; Olivia Vozar as TV Head, second place; and Leann Millhorn, The Furry, first place. Photo by FlashBang Photography. It was a lively crowd at Medina Public Library’s 10th Annual Teen Mini Con. Photo by FlashBang Photography. Noah Arntzen portrayed the Rocketeer in a self-made costume. Photo by FlashBang Photography. Getting into the spirit of the night are, from le , Megan Tick as Katsuki Bakugou, Emma Anderson as Hitoshi Shinsou, Lushen Sladky as Kaminari Denki, and Kari Dunne as Kirishima EIjirou. Photo by FlashBang Photography. Lea stood looking up at me, and I couldn’t tell if it was real life for a second. All that we had been searching for, all that we had been working for, was this young girl who now stood in front of us like it was nothing. She was there. As I stood there dumbfoundedly, she threw her arms around me and squeezed. In a word, it felt like home. “Cameron! You made it! I can’t believe you actually made it!” My heart pounded in my chest, but you never would have guessed it. Seeing my sister in real life for the first time in ages had triggered something deep inside me that made me more protective of her in that moment than I had ever been before. She was my younger sister, and I was her older brother, and the only thing that mattered in that moment was that I could keep her safe and sound. Hot tears started to stream from my cheeks as I wrapped my arms around her small frame. She squeezed tighter and I squeezed back, embracing both her and the moment. I buried my face in her hair while she buried hers in my chest, and I realized she was crying, too. My knees shook slightly, but never faltered. There was no way they could have. I had found my sister, and nothing in the world could keep us apart anymore. “I love you,” I whimpered through my tears, rubbing my cheek on the top of her head. “I love you, too,” she sobbed, her fingers grasping the back of my shirt, making sure nothing could pull me away. We’d been separated by my mother for years, but that meant nothing. CHAPTER 25 “Don’t you ever call me that,” she shouted back at me, approaching me once again. “What? Kizinsky? Why not? Are you ashamed that your beloved mother has such a dark past? Do you feel guilty for what she put me through? Do you care about me at all?” I shot at her like a machine gun, relentlessly. “No! Because that man hurt my mom more than you could ever know!” “Your mom? Your mom? You mean our mom? Did you forget who you’re talking to? We’re related, no matter how badly you may want to be her only child, you aren’t!” “Yeah? Well, neither are you, idiot. You’re not even your dad’s only child! You’re just the firstborn, so you just repressed any memories you had, didn’t you?” “What in the world are you talking about? You’re crazy, just as crazy as your mother,” I spat back, realizing I was clenching my fists at my sides. By this point, Lea was right in front of me, and we were fuming at each other, still shouting even though we were only a couple feet apart. “Oh, so now she is my mother? Good, because your father is a horrible person!” “No, he isn’t!” I screamed into her face. “Yes, yes he is!” “He can’t be a horrible person, because he’s dead!” “Good!” She tried to cut herself short, but the word had already left her lips. Do you delegate? Just answer yes or no. Next question: Do you delegate enough? That is a bit harder to answer, is it not? I would venture to guess that the answer to the first question is yes and the second is no. As business owners, I believe we do not delegate enough. There are various reasons for that, but the primary reason is because we think we are the only ones who can do it right, and when I say “it” that means everything! How can you start delegating more? By realizing that you are not able to do everything. Believe it or not, you are not good at everything. Please take a moment to acknowledge that, I will wait. How can we fix this problem? Try this exercise. Write down a list of all of your responsibilities for your business. This list may be several pages long, and you can break it up by the following topics: Administration, Operations, Sales and Human Resources, feel free to add addition topics. Under each topic, list everything you do. For example, under Administration, you would have: billing, paying bills, doing spreadsheets, etc. A er you have compiled your list, be honest with yourself, and start crossing oﬀ the things you are not very good at and do not like to do. Ask yourself which crossed-out items can be delegated. Can they be delegated to someone who already is working for you, or will you have to hire someone to take over these tasks? The idea of letting go can be scary but think of all of the things you will be able to accomplish when you do. For example, if you are a person who does not enjoy things like billing, spreadsheets and filing and you eliminate those tasks from your daily routine, then you can spend that extra time growing your business by doing the things you are good at and enjoy. The majority of networkers believe eﬀective networking is a numbers game: - The more I tell someone about me, the more likely they will remember me. - The more hands I get my card into, the better it is for me. - The more people I meet, the better. Networking has never been nor should it ever be a numbers game. It should be a respect principle. This is essential for eﬀective networking. Respect means having a deep admiration for someone. That admiration comes from what you know about someone’s abilities, qualities, or achievements. It would seem from that definition that you need to express your abilities, qualities, or achievements as much as you can and to as many as you can. Turns out, the most eﬀective way of building this respect is through simple action and listening. If you are someone people respect, others will spread the word about you. When you meet someone new, you need to put your respect principle into action, that is, respect the other person’s character and qualities first, then seek to find out their abilities and accomplishments. They will then want to know more about you and that puts you into a relationship with them where they are eager to listen to you, not dreading the moment they said ‘hello’ to you. Respect is earned! That means it is a result of actions Let your actions this month show you respect others’ presence, then watch to see if they come to respect you enough to learn about you. If they do not, they are someone you do not need to try to convince. Fill your life and networking with respect. You will be glad you le the numbers game behind! Steve Rak is a resident of Medina, is an award-winning columnist, and has spoken at various workshops and conferences throughout the United States and Canada. He is the owner of Rak Consulting, hwww.rakconsultingllc.com/ , and Southwest Landscape Management, www.sw-landscape.com/ If you have questions or suggestions for future column topics, please e-mail Joy@BlakeHousePublishing.com with “In Box” in the subject line. The basement can be the No. 1 place to find mold in a home, with attics being a close second. This is because of the many ways water can enter the picture. It is important to understand that water can show up as relative humidity in the air, as puddling on the floor, or just as the level of saturation in the floor joists, the sill plate, the rim joists or even in the foundation’s surface. It does not matter whether the surface is terra-cotta tile block, cement block, or a solid poured-cement wall. The level of moisture in these basement areas is known as surface water activity. While working in a Parma emergency room, Dr. Kim Bowen discovered many patients had jobs but no insurance and a neighbor was unable to get needed blood pressure medicine because he did not have insurance. This led Dr. Bowen to create the Parma Health Ministry. A er moving to Medina, he once again discovered the cost of medical care was keeping people from seeing doctors and getting prescriptions. He approached others with the idea of opening a clinic in Medina like the Parma one. Two men, Dr. John Surso and Phil Brewer, joined the eﬀort and became board members. In 2004, the Medina Health Ministry opened its doors and began providing care to county residents. The name was changed to the Free Clinic of Medina County in early 2018 to better communicate the services provided. Twenty-four doctors and nurses volunteer at the clinic. A majority of the clinic’s patients get free diagnostic testing through Cleveland Clinic and free prescriptions through pharmaceutical company programs. Nancy Peacock, clinic executive director, works with area employers to ensure new hires who do not qualify for medical insurance are aware of the services the free clinic oﬀers. Those eligible for services must be employed Medina County residents between the ages of 18 and 64, not be on Medicaid or Medicare, and have an income within 250 percent of the poverty level. In 2018, incomes qualifying for service ranged from a family of four with an income under $62,750 to a single person with an income under $30,350. The long-term goal for the clinic is to add locations in Brunswick and Wadsworth, in addition to the clinic’s existing locations at Cleveland Clinic Medina General and Cleveland Clinic Lodi Hospital. Hours are by appointment only, which can be made by calling 330764-9300 or e-mailing info@FCOMC.org. An annual August pig roast is the clinic’s main fundraiser. More information and tickets for the roast are available at https://bit.ly/2QrWVqA. Volunteers with oﬀice, administrative, or medical experience are needed. To volunteer or to make a donation and learn about the Logsdon Family Foundation $25,000 matching pledge, go to www.FCOMC.org. Water can leak into the basement through step cracks or horizontal cracks in the mortar between the blocks. Blocks even can crack through the middle, with large enough cracks that you can look through and see your car in the driveway. A block foundation wall can withstand about 650 pounds of horizontal pressure before it will break and crack. Without proper drainage, about ¼ inch per foot for a minimum of 10 feet from the foundation, water can freeze against the foundation. As water freezes, it can generate up to 27,000 pounds of pressure per square inch. With this in mind, look at your flower bed against the house. You might think, “Oh yes, I have plenty of slope away from the house, I can tell by the mulch.” The problem is that water permeates the mulch and is held there so foliage can use the moisture. If you dig down to the clay, you will o en find the clay has a reverse slope against the house. So the water runs through the mulch and back against the house on top of the near-impermeable clay. When reviewing basement problem areas, keep in mind that the foundation likely was installed all at the same time. Whatever is happening in one part of the basement is likely to soon spread throughout the basement. Paul McHam is a local expert on mold remediation. For more information, visit his website at http://myairxperts.com/ and his Facebook page Moldsporewars http://bit.ly/2E2Fj3y or call 330-658-2600. Joyful Fudge by Amy Barnes Please note that the chocolate chips are measured in pounds, not bags of chips. Milk chocolate chips will make a lighter fudge, while dark chocolate chips will make a darker fudge. I like to use half of each. The chocolate-orange fudge tastes much like the chocolate oranges popular at Christmas time that you bang on a tabletop to break apart. sticking. Boil 5 minutes, decreasing heat as needed to keep from boiling over. Remove from heat. Line a 11x17 jelly roll pan (cookie sheet with sides) with heavy-duty foil. Apply margarine or butter to foil so the foil is completely and lightly covered. Variations: For chocolate-nut fudge, add 2 pounds walnuts, either chopped or broken into pieces. For chocolate-orange fudge, add 2 fluid drams of orange oil, usually found in candy-making supply sections. Pour fudge onto prepared pan and quickly spread evenly across pan. Allow to cool and set. When set, carefully li foil from pan and place on flat surface. Fold foil down to ease cutting. Cut and package in air-tight containers. February 2019 Non­Profit Calendar Friday, February 1 Work Naked Day https://bit.ly/2RKkvE0 and Bubble Gum Day https://bit.ly/2CO3ayS It may not be a good idea to celebrate both at the same time! 7 a.m. to 4:30 p.m. American Red Cross Blood Drive; Medina Hospital, 1000 E. Washington Street, Medina. https://rdcrss.org/2ybO4Rp 5:30 p.m. to 10 p.m. Bluegrass Jam and Dinner; Lafayette United Methodist Church, 6201 Lafayette Road, Medina. Kitchen opens at 5:30 p.m., music starts at 7 p.m. Donation admission $3, dinner is additional donation request. Bring favorite dessert to share. Bluegrass bands welcome, arrive early to be scheduled. story time, music, fun. Register at https://bit.ly/2H6wLdG 11:30 a.m. to 1 p.m. Book Lovers Luncheon; Seville Library, 45 Center Street, Seville. Bring appetizer to share. Register at https://bit.ly/2SQRqUF 5 p.m. to 10 p.m. Board Gamers United; Medina Library, 210 S. Broadway Street, Medina. Try strategy, war, or other games. Sunday, February 3 Feed the Birds Day https://bit.ly/2BnhjXd 8:30 a.m. to 1 p.m. Annual Pancake Breakfast; Lafayette Township Fire Station 2, 5834 Heather Hedge Drive, Chippewa Lake. Benefits Lafayette Township Firefighters Association. Pancakes, sausage, eggs, bacon, sausage gravy and biscuits, strawberry crepes, coﬀee, juice. Adults, $12; senior citizens, veterans with ID and ages 6 to 12, $8; ages 5 and under, free. Pre-sale tickets available, contact dyoung@lafayettetwpfire.com or Awinter@lafayettetwpfire.com. 1 p.m. to 3 p.m. Save Ohio Strays Meet and Greet; Petco, 1052 Williams Reserve Boulevard, Wadsworth. 2 p.m. A Winter Wander; River Styx Park, 8200 River Styx Road, Wadsworth. Naturalist-led wander through the woods to see what is happening during the winter. Free. you will be laughing at those trying to fly a kite! All day. Kindergarten Readiness Week; Highland Library, 4160 Ridge Road, and Lodi Library, 635 Wooster Street, Lodi. Activities to prepare preschoolers for transition to kindergarten. Must be accompanied by adult. 5:30 p.m. to 10 p.m. Bluegrass Jam and Dinner; Lafayette United Methodist Church, 6201 Lafayette Road, Medina. Kitchen opens at 5:30 p.m., music starts at 7 p.m. Donation admission $3, dinner is additional donation request. Bring favorite dessert to share. Bluegrass bands welcome, arrive early to be scheduled. Noon to 5 p.m. Be My Valentine; Susan Hambley Nature Center, 1473 Parschen Boulevard, Brunswick. Sunday, February 10 Umbrella Day https://bit.ly/2H1st7r 8:30 a.m. to 1 p.m. Annual Pancake Breakfast; Lafayette Township Fire Station 2, 5834 Heather Hedge Drive, Chippewa Lake. Benefits Lafayette Township Firefighters Association. Pancakes, sausage, eggs, bacon, sausage gravy and biscuits, strawberry crepes, coﬀee, juice. Adults, $12; senior citizens, veterans with ID and ages 6 to 12, $8; ages 5 and under, free. Pre-sale tickets available, contact dyoung@lafayettetwpfire.com or Awinter@lafayettetwpfire.com. 9 a.m. to 1 pm. American Red Cross Blood Drive; St. Martin of Tours, 1800 Station Road, Valley City. https://rdcrss.org/2ybO4Rp Noon to 5 p.m. Be My Valentine; Susan Hambley Nature Center, 1473 Parschen Boulevard, Brunswick. Valentine-themed cra s and DIY gi s. Free. 1 p.m. to 3 p.m. Save Ohio Strays Meet and Greet; Petco, 1052 Williams Reserve Boulevard, Wadsworth. 2 p.m. to 4 p.m. Pinterest Project: Love Birds on a Wire Canvas; Wolf Creek Environmental Center, 6100 Ridge Road, Wadsworth. Make 16x20 canvas art piece with fabric bird silhouettes on a wire. Bring 2-inch paint brush, sharp scissors for cutting fabric and paper, all other supplies provided. Free. Register at https://bit.ly/2AJQTww 3 p.m. to 4 p.m. K-9 Kapers; Plum Creek Park North enclosed and open, 2390 Plum Creek Parkway, Brunswick Hills. Socialize dogs while hiking. Dogs must be on 8-foot nonretractable leash. Bring towel for muddy feet and water bowl for dog. All ages, must have accompanying adult. Free. No registration. All day. Medina Ice Fest; Medina Public Square. Ice carvings on display. Singles Awareness Day https://bit.ly/2M17CQv and National Gumdrop Day https://bit.ly/2RhSvrz 11 a.m. to 4 p.m. American Red Cross Blood Drive; Brunswick Library, 3649 Center Road, Brunswick. https://rdcrss.org/2ybO4Rp 5:30 p.m. Medina Ice Fest; Medina Public Square. Speed Carving Contest, 5:30 pm., 6 p.m., 6:30 p.m. Fire and Ice Tower, 7 p.m. 5:30 p.m. to 10 p.m. Bluegrass Jam and Dinner; Lafayette United Methodist Church, 6201 Lafayette Road, Medina. Kitchen opens at 5:30 p.m., music starts at 7 p.m. Donation admission $3, dinner is additional donation request. Bring favorite dessert to share. Bluegrass bands welcome, arrive early to be scheduled. 8 a.m. to 4 p.m. Hospice of the Western Reserve Warehouse Sale; Hospice of the Western Reserve headquarters, 17876 St. Clair Avenue, Cleveland. Second of two days. Gently used home furnishings, artwork, lamps, dishes, jewelry, more. Noon to 4 p.m. Medina Ice Fest; Medina Public Square. Team ice carving competition. 8:30 a.m. to 1 p.m. Annual Pancake Breakfast; Lafayette Township Fire Station 2, 5834 Heather Hedge Drive, Chippewa Lake. Benefits Lafayette Township Firefighters Association. Pancakes, sausage, eggs, bacon, sausage gravy and biscuits, strawberry crepes, coﬀee, juice. Adults, $12; senior citizens, veterans with ID and ages 6 to 12, $8; ages 5 and under, free. Pre-sale tickets available, contact dyoung@lafayettetwpfire.com or Awinter@lafayettetwpfire.com. Noon to 5 p.m. Be My Valentine; Susan Hambley Nature Center, 1473 Parschen Boulevard, Brunswick. Valentine-themed cra s and DIY gi s. Free. 1 p.m. to 3 p.m. Save Ohio Strays Meet and Greet; Petco, 1052 Williams Reserve Boulevard, Wadsworth. 1 p.m. to 4 p.m. Digital Photography: Beyond the Basics; Wolf Creek Environmental Center, 6100 Ridge Road, Wadsworth. Learn about exposure, composition, shutter speed, more. Bring digital camera and user manual. Must have moderate prior experience or taken previously oﬀered Basics class. Fee $35. Register at https://bit.ly/2FnpGnw 3 p.m. to 4 p.m. Natural Discoveries Hiking Series: Rocks and Fossils of Medina County; Princess Ledges Nature Preserve, 4361 Spruce Avenue, Brunswick Hills. Learn about Ohio’s geologic history, from ancient sea to massive glaciers, and about prehistoric animals that lived here. All ages. No registration. Free. Tuesday, February 19 Chocolate Mint Day https://bit.ly/2DfZ4R1 All day. Kindergarten Readiness Week; Buckeye Library, 6625 Wolﬀ Road, Medina. Activities to prepare preschoolers for transition to kindergarten. Must be accompanied by adult. 9 a.m. to 3:30 p.m. AARP Tax Preparation; Brunswick Library, 3649 Center Road, Brunswick. Call Medina County Oﬀice for Older Adults, 330-7239514, for appointment. listen to lecture. Register at https://bit.ly/2Fn0H3D WAITING LIST 6 p.m. to 8:15 p.m. Beginning Beekeeping; Medina Library, 210 S. Broadway Street, Medina. Fee $85 single, $100 family, includes book, more. Register at https://medinabeekeepers.com/ or call 330-723-6265. Chippewa Lake. Benefits Lafayette Township Firefighters Association. Pancakes, sausage, eggs, bacon, sausage gravy and biscuits, strawberry crepes, coﬀee, juice. Adults, $12; senior citizens, veterans with ID and ages 6 to 12, $8; ages 5 and under, free. Pre-sale tickets available, contact dyoung@lafayettetwpfire.com or Awinter@lafayettetwpfire.com. Preparation; Brunswick Library, 3649 Center Road, Brunswick. Call Medina County Oﬀice for Older Adults, 330723-9514, for appointment. 5:30 p.m. to 7 p.m. Otaku Tuesdays; Teen Area, Medina Library, 210 S. Broadway Street, Medina. Grades 6 to 12. Watch anime, cosplay, learn about Japanese culture, more. 6 p.m. to 8:15 p.m. Beginning Beekeeping; Medina Library, 210 S. Broadway Street, Medina. Fee $85 single, $100 family, includes book, more. Register at https://medinabeekeepers.com/ or call 330-723-6265. 5:30 p.m. to 7 p.m. Legal Resource Center; Medina Library, 210 S. Broadway Street, Medina. Domestic Relations Court volunteers help those not represented by a lawyer in family court. First come, first served. Monday, February 25 All day. Kindergarten Readiness Week; Brunswick Library, 3649 Center Road, Brunswick, and Medina Library, 210 S. Broadway Street, Medina. Activities to prepare preschoolers for transition to kindergarten. Must be accompanied by adult. 9 a.m. to 3:30 p.m. AARP Tax Preparation; Community Rooms A and B, Medina Library, 210 S. Broadway Street, Medina. Call Medina County Oﬀice for Older Adults, 330723-9514, for appointment. 2:15 p.m. to 4 p.m. Movie Monday! Buckeye Community Room, Buckeye Library, 6625 Wolﬀ Road, Medina. Popcorn, pillows, movie. Grade levels 6 and up. Free. No registration. 6:30 p.m. to 7:30 p.m. Getting on Track: Working Toward Financial Stability; United Way of Medina County, 728 E. Smith Road, Medina. Learn debt strategies, debt collection rights, resource management, more. Call 330-725-3926, Ext. 229, to register by Friday, February 22. 6:30 p.m. to 7:30 p.m. Pokemon Club; Community Room, Highland Library, 4160 Ridge Road, Medina. Meet other trainers, trade, share tips. Wednesday, February 27 No Brainer Day https://bit.ly/2ktM4zs All day. Kindergarten Readiness Week; Brunswick Library, 3649 Center Road, Brunswick, and Medina Library, 210 S. Broadway Street, Medina. Activities to prepare preschoolers for transition to kindergarten. Must be accompanied by adult. 9 a.m. to 3:30 p.m. AARP Tax Preparation; Community Rooms A and B, Medina Library, 210 S. Broadway Street, Medina. Call Medina County Oﬀice for Older Adults, 330-723-9514, for appointment. 1 p.m. to 3:15 p.m. A ernoon at the Cinema; Sycamore Room North and South, Brunswick Library, 3649 Center Road, Brunswick. Call for title, 330-2734150. 2:15 p.m. Share the Love; Buckeye Library, 6625 Wolﬀ Road, Medina. Create items to share with others. Grades 6 to 12. Thursday, February 28 Public Sleeping Day https://bit.ly/2RKpp3S All day. Kindergarten Readiness Week; Brunswick Library, 3649 Center Road, Brunswick, and Medina Library, 210 S. Broadway Street, Medina. Activities to prepare preschoolers for transition to kindergarten. Must be accompanied by adult. 9 a.m. to 3:30 p.m. AARP Tax Preparation; Brunswick Library, 3649 Center Road, Brunswick. Call Medina County Oﬀice for Older Adults, 330723-9514, for appointment. 9:30 a.m. to 11:30 a.m. Camp Wired; Medina Computer Lab, Medina Library, 210 S. Broadway Street, Medina. Learn and refresh computer skills. Ages 55 plus. Call for topics, 330-725-0588. Events listed in the calendar must be a festival or fair or hosted by or bene a non-profit organization in Medina County. Send submissions to Joy@BlakeHousePublishing.com and put CALENDAR in the subject line. Event information is not accepted by phone. The calendar is also available online at JoyofMedinaCounty.com, where it is regularly updated with additional event information.